Ontario Premier Doug Ford attends question period in Ontario legislature in Toronto on Oct. 30, 2018. 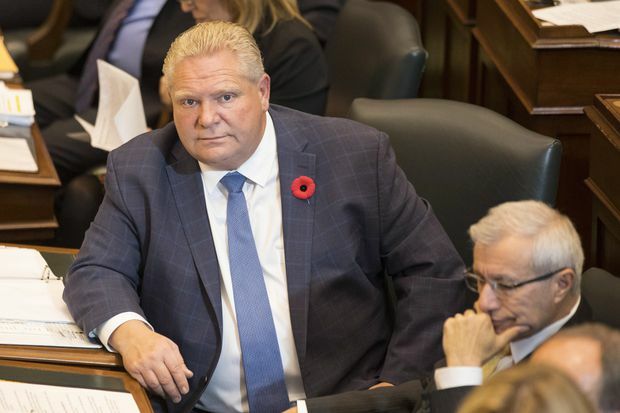 Ontario Premier Doug Ford has shuffled his cabinet four months into his term, after the loss of a senior minister who now faces a third-party investigation. On Monday, Global News reported that former economic development and trade minister Jim Wilson was forced to resign when confronted with an allegation of sexual misconduct. Community and Social Services Minister Lisa MacLeod confirmed on Monday that the government launched a third-party investigation into an allegation against him, without specifying its nature. The cabinet minister’s departure came on the same day that Mr. Ford lost a top staffer that Global said is facing different allegations of sending sexually inappropriate text messages. Mr. Wilson resigned from his cabinet position and from the Progressive Conservative caucus abruptly last Friday, with the Premier’s Office saying he was seeking treatment for addiction issues. The veteran cabinet minister had spent most of the day with Mr. Ford touring Sarnia, Ont. When asked about the allegation on Monday, Ms. MacLeod only confirmed an investigation had begun. “My understanding is that swift action was taken … he resigned from caucus immediately and an investigation was put in place,” Ms. MacLeod told reporters in Ottawa. Ms. MacLeod also confirmed the existence of a second investigation. Andrew Kimber, Mr. Ford’s former executive director of issues management, resigned on Friday. He told The Globe on Sunday he was leaving politics to work in the private sector. But Global reported he resigned over allegations of sending sexually inappropriate text messages to a staffer at the legislature. Mr. Kimber is married to Amanda Philp, Mr. Wilson’s former chief of staff, although there is no evidence to suggest the allegations are related. “I know in both instances that were revealed today that third-party investigations started to take place immediately,” Ms. MacLeod said. The Globe and Mail has not independently confirmed the allegations. Neither Mr. Wilson’s office nor Mr. Kimber responded to requests for comment. Mr. Ford’s office said on Monday that Mr. Wilson has entered a treatment facility to deal with addiction issues, and confirmed that Mr. Kimber resigned from the Premier’s Office. The office said it doesn’t comment on details of internal staffing matters. “Generally speaking, if allegations are brought forward to senior staff of the Government or the PC Caucus, a process is activated immediately and we provide staff with support and reassurance of their right to work in an environment that is free of harassment,” the office said in a statement. News of the allegations was reported on Monday after Mr. Ford’s cabinet shuffle, which included a demotion for embattled corrections minister Michael Tibollo. “After four months of unprecedented action, we are taking this opportunity to calibrate our cabinet assignments to ensure we continue to deliver on our commitments to the people," Mr. Ford said in a statement. Mr. Tibollo, under fire in recent days after it was revealed he or the law firm he heads was mired in multiple lawsuits, is being moved to the role of minister of tourism, culture and sport. Sylvia Jones, the current Tourism Minister, is being appointed minister of community safety and correctional services. Government House Leader Todd Smith, who took over Mr. Wilson’s post on an interim basis last week, will take over the job permanently. Mr. Smith was also minister of government and consumer services, a job that will now go to Government Whip Bill Walker. John Yakabuski and Jeff Yurek are switching roles, with Mr. Yakabuski becoming minister of natural resources and forestry, and Mr. Yurek taking over the role of transportation minister. Marie Bountrogianni, a former Liberal cabinet minister, said the early shuffle reflects that Mr. Ford took over the party with little time before the June election. “I don’t think there was really enough time for him to perhaps do the vetting that most premiers have the luxury of doing,” she said.